Trecento pubblicazioni in venticinque anni sono certamente un buon motivo per festeggiare: la rivista Mojo lo fa allegando al fatidico numero - quello di novembre 2018 - un cd di rarità e versioni alternative da collezione, dove spicca un inedito casalingo di Robert Wyatt, Invisible, realizzato una decina di anni fa su un brano di Paul Weller (poi sul suo 22 Dreams), presente anch'egli nella compilazione. 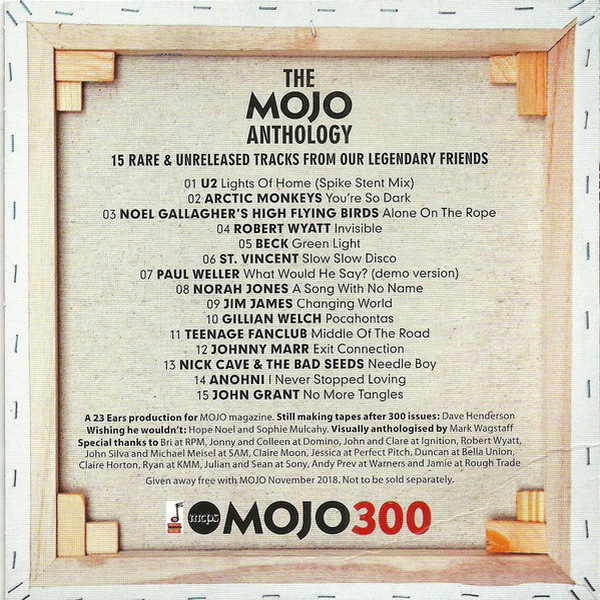 MOJO celebrates its 25-year existence with an All-Legends issue. A collectable all-white cover with embossed logo marks 50 years of The Beatles' White Album, whose upcoming reissue, enhanced with outtakes and the legendary Kinfauns demos, is explored in an exclusive in-depth feature. 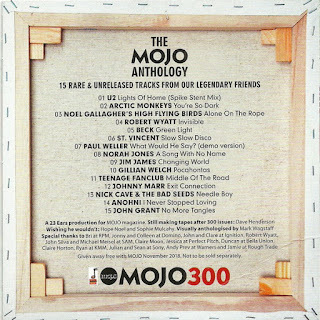 Our best ever cd, The MOJO Anthology, delivers exclusive tracks from our favourite stars, from Beck, U2 and Arctic Monkeys to Robert Wyatt, St. Vincent, Paul Weller and Nick Cave. There are revealing interviews with Elvis Costello, Jack White and Paul Simon. Jimmy Page hymns Bo Diddley. Aretha Franklin ascends to her throne. An unpublished Frank Zappa interview enthrals. Krist Novoselic remembers the dawn of Nirvana. Ray Davies, The Edge, Ron Wood, Ian Gillan, Damon Albarn, John Fogerty, Neneh Cherry, Paul Simonon, Aimee Mann and Cypress Hill drop by to share cake and champagne. Plus! Bowie, Blondie The Beach Boys, Fleet Foxes, Youssou N’Dour, Garcia Peoples and… Hair!